When it comes to building muscle tone and strength and improving athletic performance, many people don’t realize that what happens outside of the gym is just as important as what happens inside. That is, you can work out as hard as you want but if you don’t ensure your body recovers from and positively adapts to the training, you’re not going to see the results you want. First and foremost in accomplishing this is proper diet and nutrition, of course. If you don’t give your body the right types and amounts of food and nutrients, it will never be able to perform and recover optimally. Eating right is more than half the recovery battle, but when you want to do everything you can to safely and healthily see what your body is really capable of, then you want to supplement as well. And that’s why we created the Rapid Recovery Stack. It contains three supplements that improve muscle recovery, reduce joint strain and inflammation, and relieve the burdens of physical and mental stress. 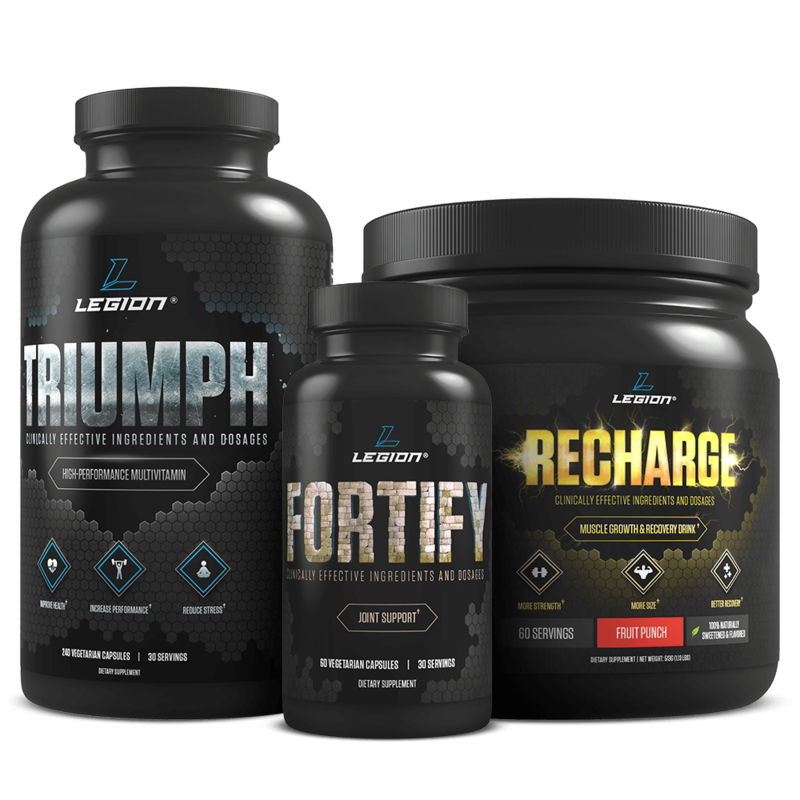 Buy this stack now and get ready to recover faster from your workouts, reduce joint pain, inflammation, and other effects of stress, and improve your mood and overall sense of wellbeing. FORTIFY is a joint health supplement that provides joint pain relief and helps keep your joints healthy and functional in two ways: it reduces joint inflammation and prevents cartilage loss. It accomplishes this by providing 100% natural, safe substances that are scientifically proven to improve joint health, reduce joint pain and inflammation, and protect against joint disease and dysfunction. As with TRIUMPH, taking FORTIFY with a meal containing dietary fat will maximize absorption.